If you want a timeless, elegant event with a hint of a fairytale, an Old World wedding vibe will deliver just that. 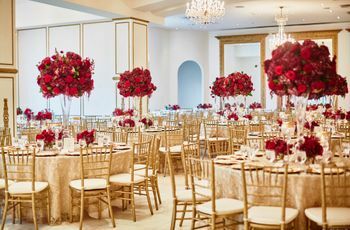 If you want a timeless, elegant event with a hint of a fairytale, an Old World wedding vibe will deliver just that. Romantic styles can take shape in many forms with the right details — modern, whimsical, moody, etc. — but none is quite as lovely as the Old World style. Rich in an ethereal, vintage, and European feel, the look evokes a soft decadence that will never go out of style — think ornate details, gilded touches, swirling calligraphy, floating linens, and old stonework. So just how do you cast its spell and create the Old World wedding of your dreams? 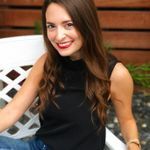 Of course, you’ll first want to set the tone with your invitations. Elegant calligraphy is a must for that Old World wedding feel, and a neutral palette in shades of beige and ivory is reminiscent of old stonework — when coupled with gilded designs or gold leafing, the invites take on a romantic spin. 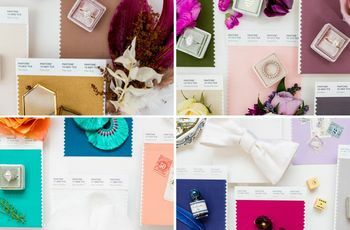 Other details, such as a leaf motif or carefree blush brushstrokes, seen in the invite, above evoke subtle fairytale charm. When it comes to your ceremony, let the venue do most of the work to relaying the style. 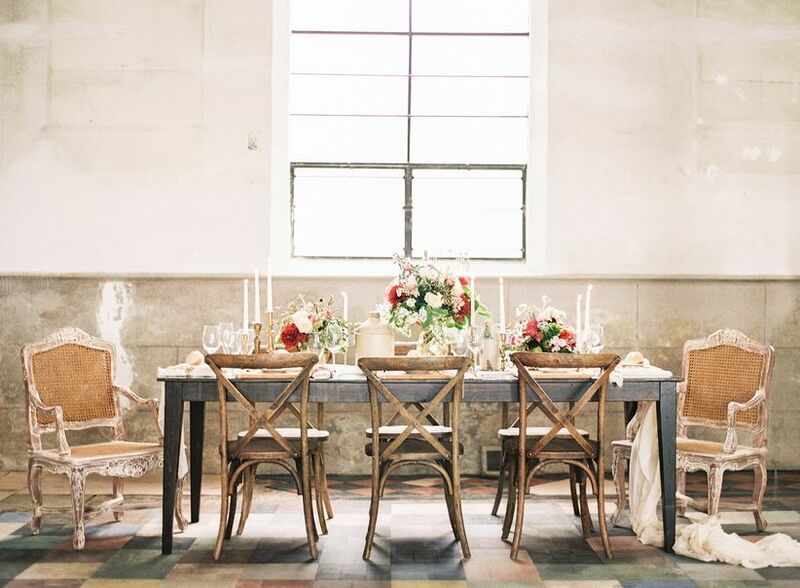 Look for a place with antique masonry, vintage character, distressed walls, or hints of European-inspired architecture to create an Old World wedding setting that will transport you back in time. Go light on the decor so you don’t detract from the surroundings. Mismatched vintage ceremony chairs marked by soft bouquets perfectly add to the vibe of the space without being overwhelming. When you do bring in the décor though, there are a few statement details that immediately evoke Old World style. Vines of green, for one, call upon old Tuscan gardens. But the one detail that is a must is candles. No tea lights, containers, or votives here. 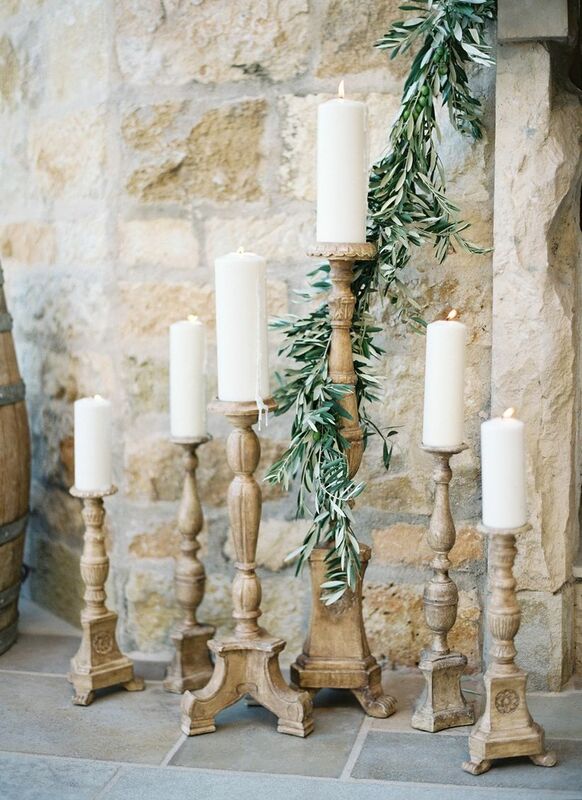 We’re talking long tapered candles in some gorgeously opulent candelabras or thick pillar candles in vintage wood holders. Cluster them at the foot of entrances or tables for a soft glow, or arrange them in a half circle for a makeshift ethereal altar. 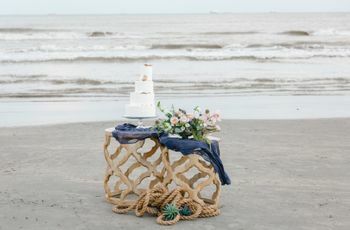 How romantic is this sweetheart table? 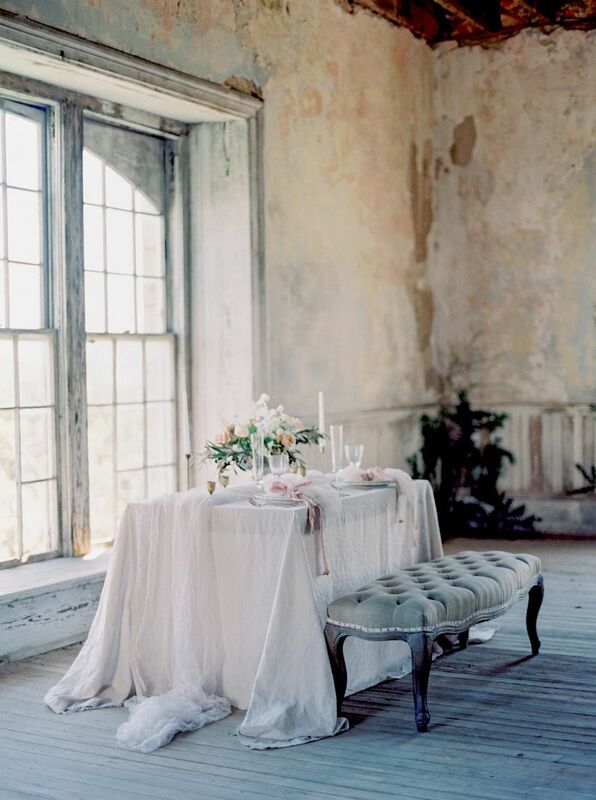 Take a cue from its simple, but striking look, courtesy of two main elements — gauzy linens and an heirloom bench. 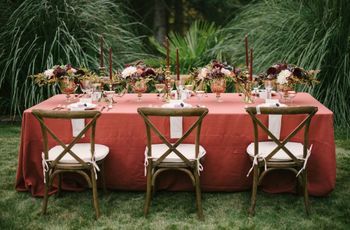 When choosing tablecloths and runners, opt for light, airy, cascading fabrics that pool at the floor for a dreamy effect, and don’t be afraid to layer them on top of each other. A French Renaisssance-style bench topped in dusty blue makes for the perfect seating, emitting vintage charm while creating intimacy by allowing newlyweds to sit close to one another. 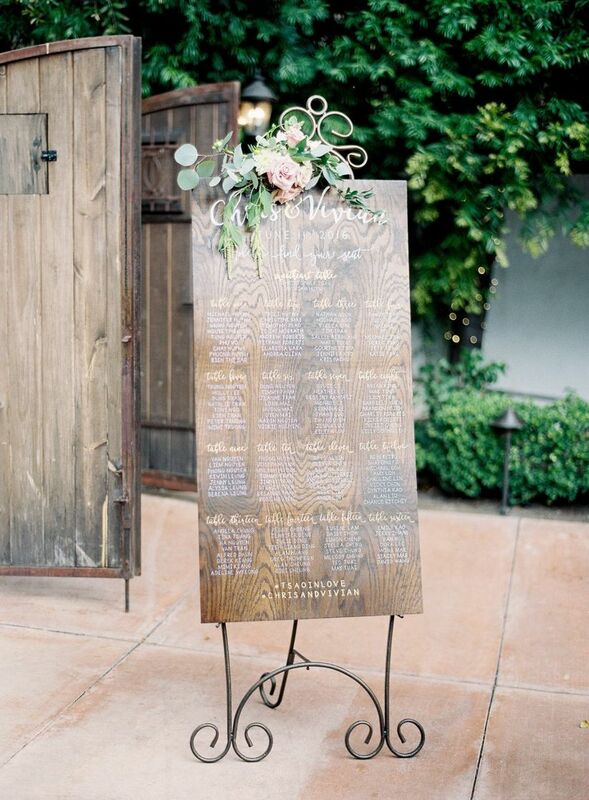 We love an elongated piece of wood or an oversized piece of parchment for a seating chart. 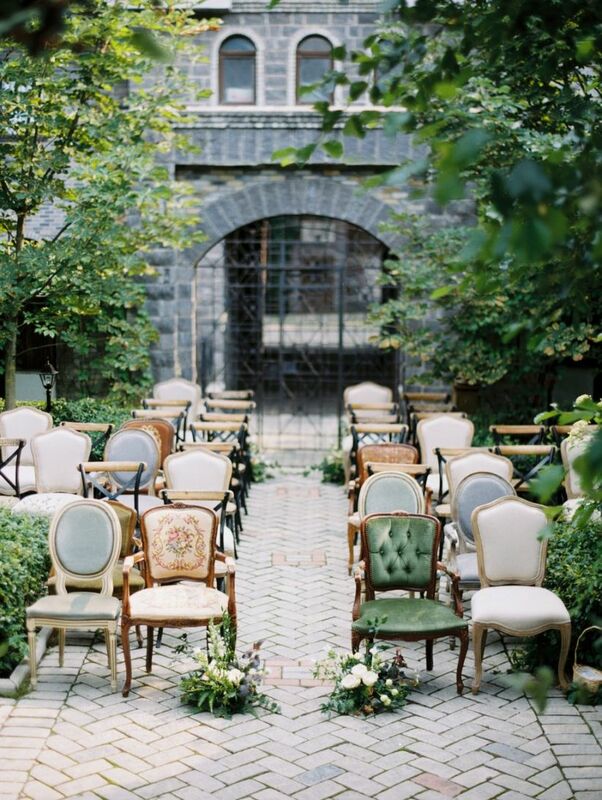 This one in particular brings a bit of refined rustic to Old World romance, as if the wedding was held in the sprawling gardens behind a castle. A swag of eucalyptus and classic pink roses combines with a wrought iron easel of delicate curves to complete the feel. You can’t go wrong with ornate, gold details — especially when it comes to your plateware and flatware. 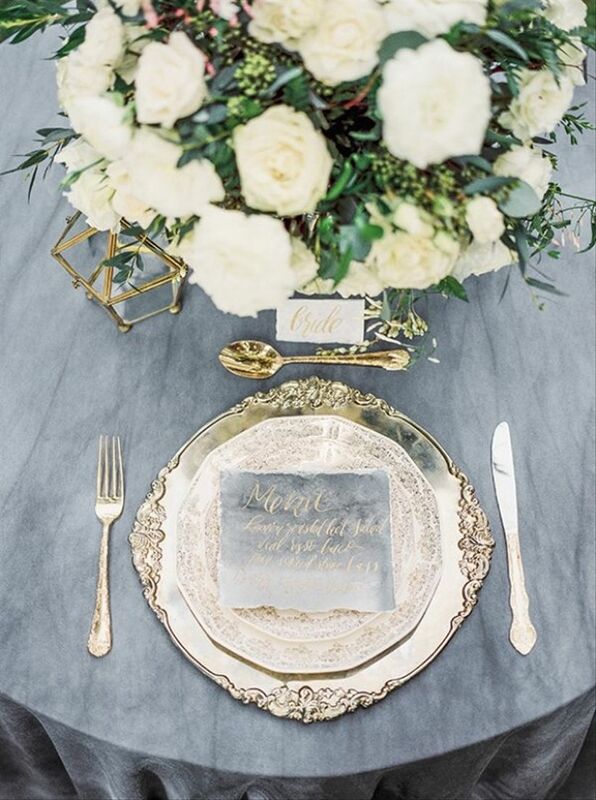 Intricate, scalloped edges and gilded patterns add a dose of opulent glam; we bet Marie Antoinette wouldn’t mind dining at one of these place settings! Keep the menus and name cards in a similar style to your invitation — parchment with gold calligraphy. The torn edges in this menu lend a distressed, antique look while a smoky watercolor background ties in with the husky tablecloth. This reception setting perfectly encapsulates all the beautiful details that create a romantic Old World wedding effect — delicately pooling linens, mismatched chairs, tapered candles, distressed stone walls, wooden touches, and antique jug vases. Crimson flowers in the centerpieces pop against a neutral setting for unexpected beauty. The result is totally swoonworthy. Keep the hallmarks of Old World decor in your dessert display by adorning it with sheer fabric, a lovely vine, and flickering candles in brass holders. 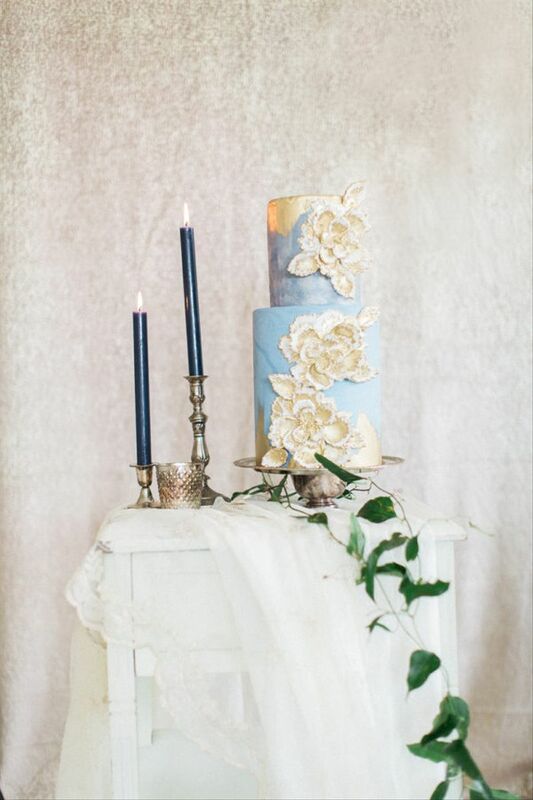 As for the cake, take inspiration from your paper goods with a watercolored canvas and gilded accents. 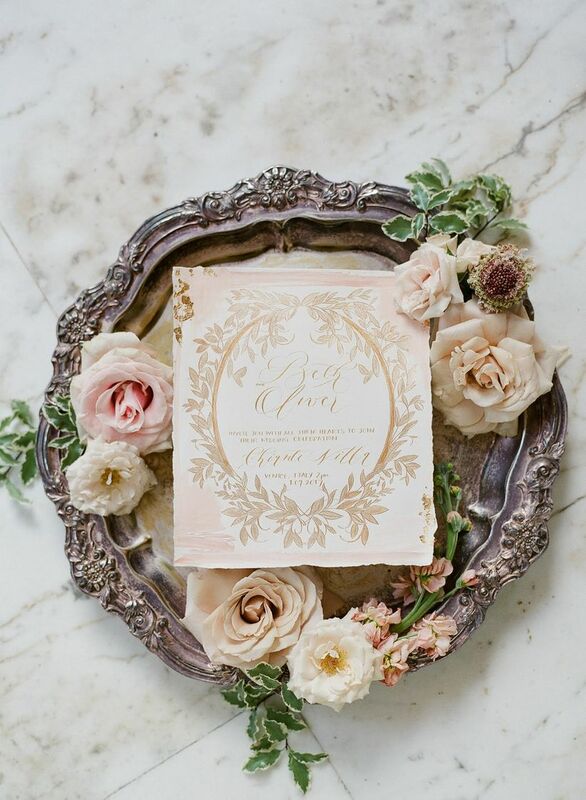 Metallic foil and lush gold fondant flowers create a vintage, European inspired feel. Moody and dramatic pairs with soft and gentle in this display thanks to contrasting blue tones.